Arguably no other film in history (with exception of John Huston’s The African Queen, 1951) has had a more infamous production than Francis Ford Coppola’s Apocalypse Now (1979). The film suffered enormous set-backs, disasters, financial woes and scheduling issues that plagued the film’s production; the lead star was replaced three weeks into production, then the replacement suffered an almost-fatal heart attack, another star showed up on set unorganised and not prepared to take the director’s orders, sets were hit and practically destroyed by a mass hurricane, crew members got sick and began to go mad, the director went over budget due to elaborate, larger than life sequences, and had to dig into his own pocket and even mortgage his own house and belongings to complete the film. One by one, disaster after disaster, the film higher and higher into debt and further and further over schedule. With an original shooting schedule of six weeks that turned into a grueling sixteen month shoot – amounting to an un-matched six million feet of footage that made editing near impossible- it’s no wonder that the media labelled the film ‘Apocalypse When?’ “We had access to too much money, too much equipment, and little by little we went insane” is how Coppola put it. But what it amounted to was one of the greatest milestones, and arguably the greatest war film in cinema history. 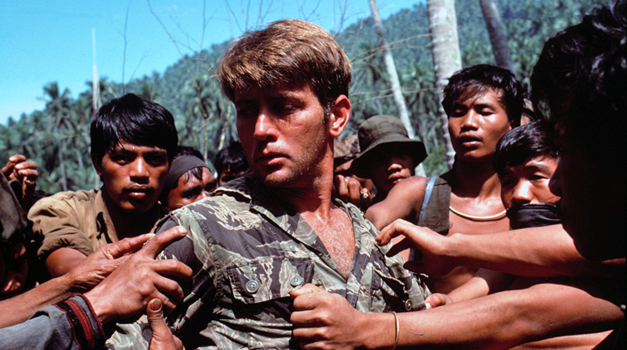 This epic Vietnam war film tells the story of US Captain Benjamin Willard who is sent on a mission to assassinate renegade Green Beret Colonel Walter E. Kurtz who has formed a sadistic cult of local tribes people on a remote island in Cambodia and declared himself a God. Willard sets out down a dangerous river on a journey that will leave him and his short-lived comrades never the same again. As Willard’s passage unravels he learns the true meaning of war, and finds out who he truly is. A young and fit Martin Sheen stars as Willard while an aging and over-weight Marlon Brando plays Colonel Kurtz. The film features an array of brilliant big-name talents in supporting roles including Robert Duvall and Dennis Hopper with Laurence Fishburne and Harrison Ford in one of their earliest film roles. Three years after production had begun, Apocalypse Now opened at the Cannes Film Festival in 1979 to a standing ovation and prolonged applause, before becoming the winner of the festival’s coveted Palme d’Or award. When the film opened in theatres later that year, it earned approximately US $150 million at the box-office worldwide, and became the US’s third highest grossing film of the year. The film was nominated for 8 Academy Awards including Best Director, Best Screenplay Based on Material from Another Medium and Best Picture. Out of the 8 nominations the film walked away with 2 Oscars one for legendary Vittoria Storaro’s brilliant Cinematography and one for Best Sound. However, it was in 2001 that Coppola released Apocalypse Now: Redux, an all new re-cut and extended (by approximately 50 minutes) version of the movie. As legend goes, Coppola was watching television late at night sometime in the late 1990s when Apocalypse Now came on. He, for the first time in years, watched the film and came to the conclusion that it was “tame” in comparison to the day’s standards – A thought that eventually lead to this re-imagining of his original masterpiece, which was placed at #28 on the American Film Institute’s list of 100 greatest films of all time and which now sits at #31 on IMDB’s list of Top 250 best films. Running at just under 3 and a half hours (but don’t worry you’ll get an intermission,) Apocalypse Now: Redux is considered the definitive version of the film and we are proud to present this masterpiece of filmmaking on an amazing, original 35mm Technicolor dye-transfer print – the way it was meant to be seen. If you are a fan of the film, but have never seen it on the big screen, take it from me, you have never fully experienced the film. From the opening sequence of whirring helicopters and exploding napalm, to the spooky carnivalesque battle camp scene, right to the powerful and sadistic Kurtz Compound sequence at the end of the film, your eyes will be glued to the screen. You will be absolutely blown away by the film’s pristine image, a clarity brought through in what amounts to a highly stylised, surrealistic and saturated Technicolor experience. The film has a large screen space in its 2.35:1 aspect ratio and an amazing DTS digital soundtrack, which both amount to a film experience like no other, putting you right in the centre of the action. Coppola once said, “My film is not about Vietnam, it is Vietnam,” and after you walk out of the theatre you will feel like you were there. This is definitely one film you will want to see from the very front row, and one film experience you do not want to miss. And the only place you can see it is at the Astor Theatre. Written by our E-news reviewer Dave Lee for The Astor Theatre. 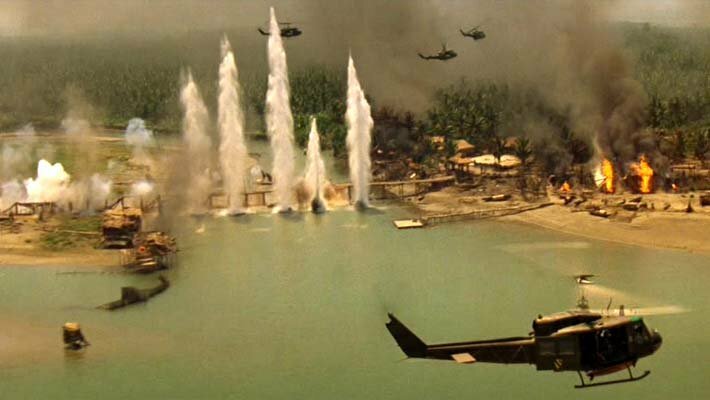 Apocalypse Now: Redux screens at The Astor Theatre on Thursday August 25th 2011, 7.30pm.